CMJ was founded in 1809 by Evangelical Christians who believed that the Christian gospel, which came from a Jewish context, should be shared with Jewish people as a priority. Its original name: “The London Society for Promoting Christianity among the Jews,” though couched in unhelpful terminology, was intended to describe this purpose. The Society also reached out to Jewish people in compassion, providing hospitals, schools, job creation and training for the unemployed as well as teaching and worship in Hebrew. CMJ believes that the term “Restoration” when applied to the Jewish people is primarily restoration to their Messiah, Yeshua HaMashiach, Jesus the Christ; and secondarily restoration to a safe homeland after 2000 years of persecution. Furthermore, the focus of New Testament eschatology (the doctrine of the end times) is on Jesus and holy living, rather than land. However, the question of what the Ministry thinks about the State of Israel and its relationship to the Palestinians is important – hence this statement. 1. CMJ encourages the Church to express sorrow and regret before God for the dreadful history of Christian anti-Semitism and to renounce all anti-Semitic attitudes. At the same time it encourages the Church to renounce any negative or uncaring attitudes towards Arabs in general and Palestinians in particular. 2. CMJ believes that God has neither finally rejected the Jewish people nor replaced or superseded them by the church. A “remnant” of Jewish Believers has always been included in the church. But what of the majority? Paul teaches that God has a special purpose to bring them to faith in Christ. He writes: “Did God reject his people? By no means”. He adds: “Did they stumble so as to fall beyond recovery? Not at all”. Paul foretells a future blessing for them, and through them for the world, which he variously describes as “their fullness”, “their acceptance” which will be “life from the dead”. He concludes: “Israel has experienced a hardening in part until the full number of Gentiles has come in. And so all Israel will be saved…” Romans 11:1, 11-15, 25,26). 3. CMJ rejoices in the growing number of Jewish Believers in Jesus, in Israel and throughout the world. 4. CMJ believes that both Jewish and Gentile believers (including our Palestinian brothers and sisters) are united in the one “olive tree”. In fact, Jesus has made Jew and Gentile. This Statement was unanimously agreed by the CMJ Council on 22 July 2004, having previously been approved by Jewish believers one “and has destroyed the barrier, the dividing wall of hostility, by abolishing in his flesh the law with its commandments and regulations. His purpose was to create in himself one new man out of the two, thus making peace, and in this one body to reconcile both of them to God through the cross, by which he put to death their hostility”. Jews and Gentiles alike are reconciled to God through the cross and “both have access to the Father by one Spirit”. Gentiles are “fellow-citizens with God’s people and members of God’s household …. 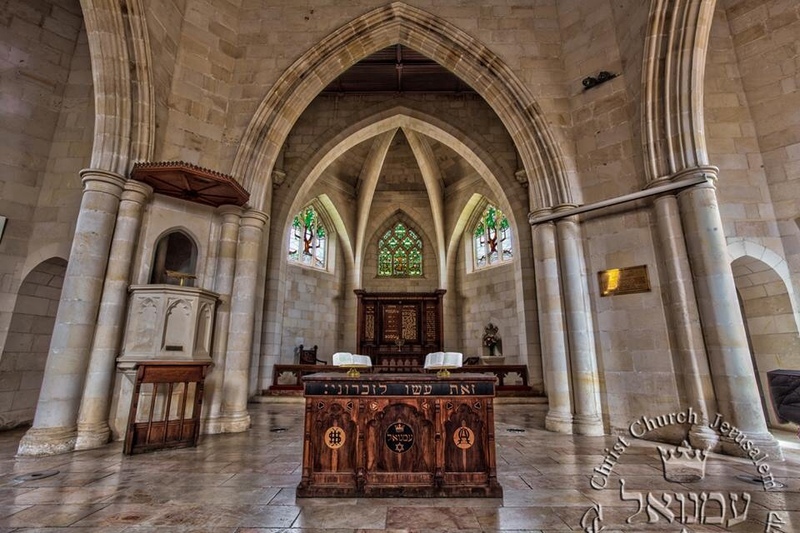 a holy temple in the Lord … in which God lives by his Spirit” (Eph 2:14-22). There is therefore “neither Jew nor Greek” in terms of standing before God (Gal 3:28). So Jewish (Messianic) Believers in Jesus are not spiritually superior to Gentile Believers. 5. CMJ has never limited its ministry in an exclusive way to Jewish people, nor does it wish to do so. The primary purpose of the Ministry is to share the love of Jesus with the Jewish people, but it also works for reconciliation between all people (especially between Israeli Jewish Believers and Israeli Arabs, between Israelis and Palestinian; Jewish people and Gentiles) because that is a demand which comes from the heart of the Gospel, for God loves all people equally. This means that he loves the Israelis and the Palestinians equally. God’s purpose in creating one new man out of Jew and Gentile is part of his greater purpose through Christ to reconcile to himself all things (Eph 2:15-16; Col 1:20). 6. CMJ does not adopt a position on any particular millennial view, but it has always seen the return of the Jewish people to their ancient land, and on a national scale to their Messiah, as a precursor to the return of Jesus in glory. 7. CMJ rejoices in God’s faithfulness to the Jewish people in ensuring their survival as a distinct people during 2000 years of exile and persecution. 8. CMJ rejoices that, after 2000 years of exile and persecution, including the Holocaust, the Jewish people now, at last, have returned to the land from which the majority were dispersed in AD70, although there has virtually always been a Jewish presence in the land. The Ministry affirms: “We see the return of the Jewish people to the land of Israel as a sign of God’s faithfulness as revealed in Scripture”. Many members of the Ministry see the return of the Jewish people to the land as the beginning of a fulfillment of covenant promises to them in Scripture. However, it must be remembered that Israel is a secular state which is no more religious than Britain. 9. CMJ recognizes that the State of Israel was set up as a result of a majority vote of the United Nations in 1947 that a Jewish state should be established within Mandatory Palestine and regrets the Arab rejection of this decision. 10. CMJ recognizes the tragic displacement of many Palestinian people, with all its attendant pain and deprivation, which resulted from the re-establishment of the State of Israel and the subsequent attack on the new state by the surrounding countries. It also recognizes the similar displacement of Jewish people from Arab nations. 11. CMJ understands the determination of the Israeli Jews to preserve the Jewish state, to avoid a return to being persecuted and abused by anti –Semites throughout the world. However the Ministry does not hold any official position as to the appropriate location of the borders of the state. 12. CMJ believes it has a particular calling to show the love of Messiah to Jewish people everywhere. But the Ministry takes the same critical approach to some policies and actions of the State of Israel as it would over any secular state. 13. CMJ affirms that God is a God of justice and peace, and that he desires justice and peace for all people groups. 14. CMJ affirms that God is a God of compassion. We should show that compassion to all innocent sufferers, whether Israeli or Palestinian. The Ministry recognizes that the Israelis, after 2000 years of anti-Semitism, face a resurgence of anti-Semitism, a military threat from various nations, Palestinian terrorism and a threat to the stability of their safe homeland through demographic factors. It also recognizes that many Palestinians have lost their ancestral homes and continue to experience military occupation. Sometimes they suffer unjustified oppression, humiliation, violence and the destruction of their homes. They also experience economic disaster and lack of infrastructure, partly through Israeli policies and partly through the failures of the Palestinian Authority. 15. CMJ deplores the resurgence of anti-Semitism throughout the world, especially in Western Europe, including the UK, which takes the form of verbal and physical attacks on Jewish people, attacks on synagogues, schools, cemeteries and memorials, a revival of the world Jewish conspiracy theories, including broadcasting of the (fictional) “Protocols of the Elders of Zion” and even a resurrection of the old blood libel, accusing Jews of ritual murders. The Ministry has always sought to stand with the Jewish people against such evils. CMJ commits itself to move beyond the present debate amongst Christians, which is often characterized by sterile polarization and inflammatory words, to show understanding and tolerance and to focus on reconciliation, justice and peace for both Israelis and Palestinians. It appeals to mission agencies and the wider church to cooperate in this. CMJ recognizes the great complexity of the Israeli-Palestinian dispute but believes that the power of God is infinitely greater than this complexity and that we should pray for his sovereign purposes to prevail. This entry was posted in Uncategorized by CMJ Australia & New Zealand. Bookmark the permalink.